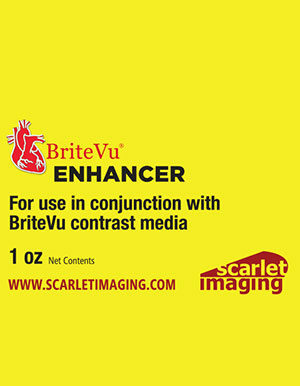 Why is BriteVu the Best Contrast Agent? Home / FAQ / Why is BriteVu the Best Contrast Agent? –First BriteVu is easy to prepare (simply mix the dry powder with warmed water, physiologic solutions or phenol) in a stirring hot plate. BriteVu also readily mixes with common water soluble dyes (especially food colorings, fluorescein, etc) creating additional color and special labeling options. Major competitor products must be mixed with specific solvents, reagents or other chemicals to perform properly. –Second, and in stark contrast to the competition, BriteVu is non-toxic requiring only standard handling and disposal procedures. See BriteVu SDS. The major competitive products contain highly toxic ingredients (for the user and environment) and must be carefully handled as special hazardous waste. Improper disposal of competitor products may violate local, state and federal laws. 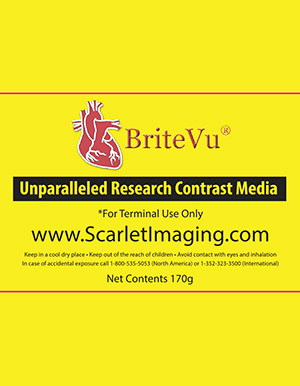 See Product Comparisons for more information about safety of BriteVu and other terminal contrast agents. –Third, BriteVu has long working times once mixed. As long as the solution is kept above 38-40oC and adjusted for any water loss, BriteVu can be kept in a liquid form for hours, if not days or weeks. Add in BriteVu Enhancer and the temperature of solidification drops to 33oC. This gives researchers plenty of time to work with BriteVu prior to it forming a semi-solid gel. The major competitor products must be used within minutes once mixed, before setting as a solid, which severely limits the working time. 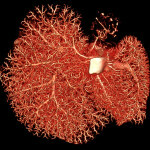 –Fourth, because of the long working time and fluidity, BriteVu can be used for whole animal perfusions. To date, BriteVu has been used on animals as small as zebra fish up to an entire horse for whole body perfusions. Due to the short working times of major competitor products, whole animal perfusions are not possible except for the tiniest of subjects. –Fifth, BriteVu is significantly less expensive than the major competitor products. There is nothing more to say other than the competitor products cost more! –Sixth, BriteVu is not only radiodense as is, its relative density increases as the vessel size narrows. This creates a stronger (radiodense) signal for tiny vessels improving visualization in small subjects and capillary beds. Competitor products tend to result in decreased radiodensity signals as vessels approach capillary sizes. 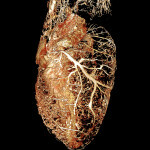 In turn this can result in signal loss and incomplete vascular imaging. 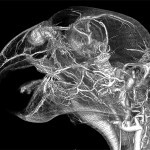 –Seventh, because the BriteVu mixture is water based it acts as an excellent MRI and ultrasound contrast agent. Additionally, gadolinium based products can be added to BriteVu for additional MRI contrast. –Eighth, Scarlet Imaging is run by a researcher who understands science and the needs of scientists. 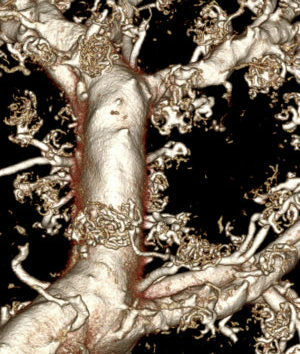 We work with students, professors, industry and more to help them solve contrast perfusion related problems. 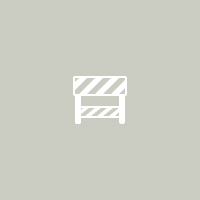 Try getting real technical support from our competitors…. 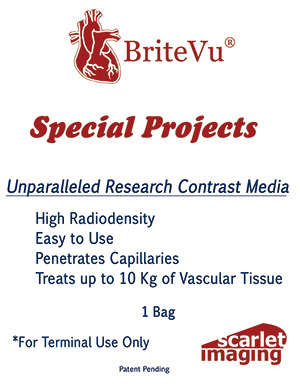 The bottom line is that BriteVu is easy to use, has high radiodensity and perfuses capillaries creating spectacular vascular casts that are opening new doors in contrast perfusion research.